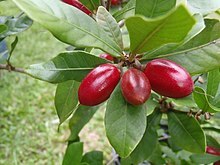 The miracle fruit is the berry of Synsepalum dulcificum, a plant from West Africa. The chemical produced by the fruit makes other food taste sweet. This chemical is called miraculin. Miraculin is a glycoprotein molecule, with some trailing carbohydrate chains. The berry has a low sugar content and a mildly sweet taste. When the fruit is eaten, miraculin binds to the tongue's taste buds, causing sour foods to taste sweet. At neutral pH, miraculin binds and blocks the receptors, but at low pH (after eating sour food) miraculin binds protons and activates the sweet receptors. This is what causes the sweet taste. This effect lasts until the protein is washed away by saliva (up to about 60 minutes). Miraculin is now being produced by transgenic tomato plants. ↑ McCurry, Justin (2005-11-25). "Miracle berry lets Japanese dieters get sweet from sour". London: The Guardian. Retrieved 2008-05-28. The berries contain miraculin, a rogue glycoprotein that tricks the tongue's taste-bud receptors into believing a sour food is actually sweet. People in parts of west Africa have been using the berries to sweeten sour food and drink for centuries, but it is only recently that the global food industry has cottoned on. ↑ Levin, Rachel B. (2009). "Ancient berry, modern miracle: the sweet benefits of miracle fruit". thefoodpaper.com. Retrieved 2009-08-20. ↑ Koizumi, A. et al (2011). "Human sweet taste receptor mediates acid-induced sweetness of miraculin". Proceedings of the National Academy of Sciences 108 (40): 16819–16824. doi:10.1073/pnas.1016644108. ISSN 0027-8424. ↑ Park, Madison (March 25, 2009). "Miracle fruit turns sour things sweet". CNN. Retrieved 2009-03-25. ↑ Hirai, Tadayoshi et al (2010). "Production of recombinant Miraculin using transgenic tomatoes in a closed cultivation system". Journal of Agricultural and Food Chemistry 58 (10): 6096–6101. doi:10.1021/jf100414v. ISSN 0021-8561. ↑ Sun, Hyeon-Jin et al (2007). "Genetically stable expression of functional miraculin, a new type of alternative sweetener, in transgenic tomato plants". Plant Biotechnology Journal 5 (6): 768–777. doi:10.1111/j.1467-7652.2007.00283.x. ISSN 1467-7644. This page was last changed on 3 October 2017, at 13:45.